Hey everyone, Sweet and I will be coming into Portland through the end of the month. We have two Brewers & Blues Against Hunger events in the area; July 27 in Longview Washington at Ashtown Brewing Company and July 29 at Buffalo Gap Saloon. 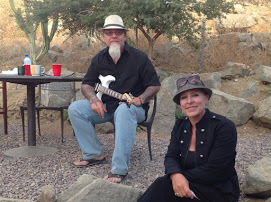 As a traveling blues duo, we are always looking for cool interesting people and places off the beaten track, and when possible out of RV Resorts....I did mention we were a blues duo. Since we have time between shows, we are looking for opportunities to play as a duo; from busking to house parties. We just want to play music as much as we can. On that note, we also want to use the down time to continue work on our new album. We could use a safe place to park a couple of days, to save a few bucks and finish recording.